LDIF translates heterogeneous Linked Data from the Web into a clean, local target representation while keeping track of data provenance. 02/13/2014: Version 0.5.2 released. This release includes a fusion policy learner extension for Sieve, additional import formats and bugfixes. 02/21/2013: LDIF moved to GitHub. 11/13/2012: Version 0.5.1 released. This release includes various minor improvements and bugfixes. New features includes the possibility to output results of each single phase and some additional configuration parameters. 06/05/2012: Presentation: LDIF has been presented at the Semantic Technology and Business Conference (SemTech2012) in San Francisco. See slides of the talk: How to Integrate Linked Data into your Application. 03/28/2012: Version 0.5 released. This release provides a data quality assessment and fusion module for cleansing data according to user-provided quality assessment policies and conflict resolution methods. 02/06/2012: Presentation: LDIF is presented at SEMTECHBIZ Berlin 2012 (Slides). 01/13/2012: Interview: semanticweb.com speaks with Christian Becker on how LDIF eases the job of working with Linked Data. 01/10/2012: Version 0.4 Scale-out released. Up till now, LDIF stored data purely in-memory which restricted the amount of data that could be processed. Version 0.4 provides two alternative implementations of the LDIF runtime environment which allow LDIF to scale to large data sets: (1) The new triple store backed implementation scales to larger data sets on a single machine with lower memory consumption at the expense of processing time; (2) The new Hadoop-based implementation provides for processing very large data sets on a Hadoop cluster, for instance within Amazon EC2. A comparison of the performance of all three implementations of the runtime environment is found on the LDIF benchmark page. 11/03/2011: Version 0.3.1 released. Minor release: updated the music use case, optimized Entity Builder memory usage. 10/06/2011: Version 0.3 released. The third LDIF release provides data access modules for gathering data from the Web via file download, crawling or accessing SPARQL endpoints. Web data is cached locally for further processing. A scheduler provides for launching data import and integration jobs as well as for regularly updating the local cache with data from remote sources. We also added a second use case that shows how LDIF is used to gather and integrate data from several music-related data sources. 8/25/2011: Version 0.2 released. The second LDIF release provides improved performance (faster data loading, parallelization of the data translation), smaller memory footprint, a new N-Triples output module, new performance evaluation results for use cases up to 100 million triples. 6/29/2011: Version 0.1 released. This alpha version provides for translating data that is represented using different source vocabularies into a single target vocabulary and for replacing different URIs that refer to the same real-world entity with a single target URI. Data about the same real-world entity coming from different sources may contain conflicting value. For example the single value attribute population for a specific country can have multiple, different values after merging data from different sources. This usage of different vocabularies as well as the usage of URI aliases makes it very cumbersome for an application developer to write SPARQL queries against Web data which originates from multiple sources. In order to ease using Web data in the application context, it is thus advisable to translate data to a single target vocabulary (vocabulary mapping) and to replace URI aliases with a single target URI on the client side (identity resolution), before starting to ask SPARQL queries against the data. Up-till-now, there have not been any integrated tools that help application developers with these tasks. With LDIF, we try to fill this gap and provide an open-source Linked Data Integration Framework that can be used by Linked Data applications to translate Web data and normalize URI while keeping track of data provenance. Collect Data: Import modules locally replicate data sets via file download, crawling or SPARQL. Map to Schema: An expressive mapping language allows for translating data from the various vocabularies that are used on the Web into a consistent, local target vocabulary. Resolve Identities: An identity resolution component discovers URI aliases in the input data and replaces them with a single target URI based on user-provided matching heuristics. Quality Assessment and Data Fusion: A data cleansing component filters data according to different quality assessment policies and provides for fusing data according to different conflict resolution methods. Output: LDIF outputs the integrated data and that can be written to file or to a QuadStore. For provenance tracking, LDIF employs the Named Graphs data model. The figure below shows the schematic architecture of Linked Data applications that implement the crawling/data warehousing pattern. 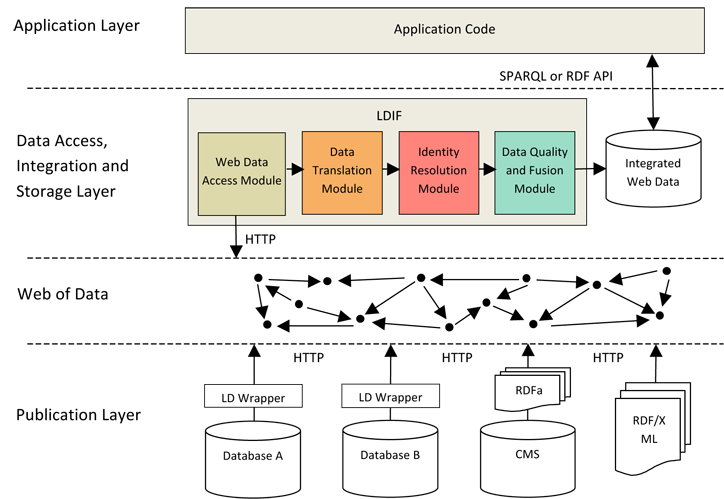 The figure highlights the steps of the data integration process that are currently supported by LDIF. The LDIF Framework consists of a Scheduler, Data Import and an Integration component with a set of pluggable modules. These modules are organized as data input, data transformation and data output. The Scheduler is used for triggering pending data import jobs or integration jobs. It is configured with an XML document (see Configuration) and offers several ways to express when and how often a certain job should be executed. This component is useful when you want to load external data or run the integration periodically, otherwise you could just run the integration component. 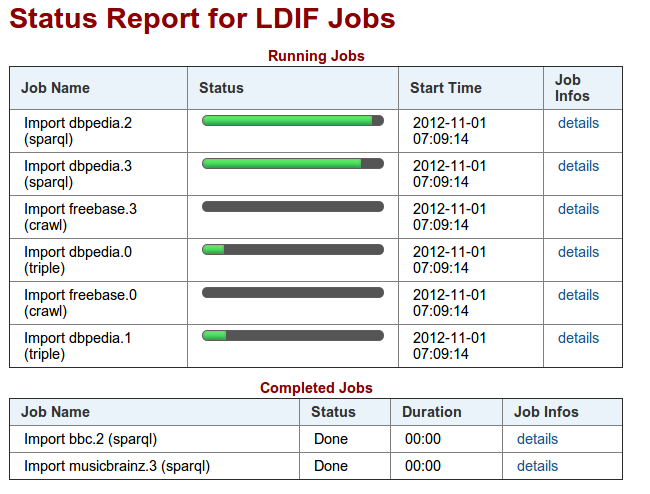 Since LDIF version 0.5 there is a REST based status monitor that informs about the progress of the scheduled jobs. LDIF provides access modules for replicating data sets locally via file download, crawling or SPARQL. These different types of import jobs generate provenance metadata, which is tracked throughout the integration process. Import jobs are managed by a scheduler that can be configured to refresh (hourly, daily etc.) the local cache for each source. In order to get a local replication of data sets from the Web of Data the simplest way is to download a file containing the data set. The triple/quad dump import does exactly this, with the difference that LDIF generates a provenance graph for a triple dump import, whereas it takes the given graphs from a quad dump import as provenance graphs. Formats that are currently supported are RDF/XML, N-Triples, N-Quads and Turtle. Data sets that can only be accessed via dereferencable URIs are a good candidate for a crawler. In LDIF we thus integrated LDSpider for crawl import jobs. The configuration files for crawl import jobs are specified in the configuration section. 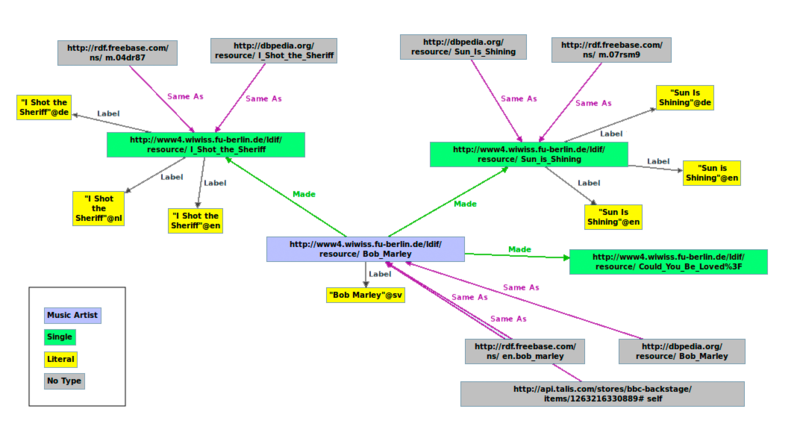 Each crawled URI is put into a seperate named graph for provenance tracking. Data sources that can be accessed via SPARQL are replicated by LDIF's SPARQL access module. The relevant data to be queried can be further specified in the configuration file for a SPARQL import job. Data from each SPARQL import job gets tracked by its own named graph. The integration component manages the data flow between the various stages/modules, the caching of the intermediate results and the execution of the different modules for each stage. The integration component expects input data to be represented as Named Graphs and be stored in N-Quads format accessible locally - the Web access modules convert any imported data into N-Quads format. LDIF employs the R2R Framework to translate Web data that is represented using terms from different vocabularies into a single target vocabulary. Vocabulary mappings are expressed using the R2R Mapping Language. The language provides for simple transformations as well as for more complex structural transformations and property value transformations such as normalizing different units of measurement or complex string manipulations. The syntax of the R2R Mapping Language is very similar to the query language SPARQL,which eases the learning curve. The expressivity of the language enabled us to deal with all requirements that we have encountered so far when translating Linked Data from the Web into a target representation (evaluation in ). Simple class/property-renaming mappings which often form the majority in an integration use case can also be expressed in OWL/RDFS (e.g ns1:class rdfs:subClassOf ns2:clazz). An overview and examples for mappings are given on the R2R website. The specification and user manual is provided as a separate document. LDIF employs the Silk Link Discovery Framework to find different URIs that are used within different data sources to identify the same real-world entity. For each set of duplicates which have been identified by Silk, LDIF replaces all URI aliases with a single target URI within the output data. In addition, it adds owl:sameAs links pointing at the original URIs, which makes it possible for applications to refer back to the data sources on the Web. If the LDIF input data already contains owl:sameAs links, the referenced URIs are normalized accordingly (optional, see configuration). Silk is a flexible identity resolution framework that allows the user to specify identity resolution heuristics which combine different types of matchers using the declarative Silk - Link Specification Language. An overview and examples can be found on the Silk website. LDIF employs Sieve to provide data quality evaluation and cleansing. The procedure consists of two separate steps. First, the Data Quality Assessment module assigns each Named Graph within the processed data one or several quality scores based on user-configurable quality assessment policies. These policies combine a assessment function with the definition of the quality-related meta-information which should be used in the assessment process. Then the Data Fusion module takes the quality scores as input and resolves data conflicts based on the assessment scores. The applied fusion functions can be configured on property level. Sieve provides a basic set of quality assessment functions and fusion functions as well as an open interface for the implementation of additional domain-specific functions. An overview and examples can be found on the Sieve website. LDIF final and intermediate results can be written to file or to a QuadStore. N-Triples - dumps the data into a single N-Triples file, since there exists no connection to the provenance data anymore after outputting it as N-Triples, the provenance data is discarded instead of being output. Data is written to a QuadStore as SPARQL/Update stream. Here is a list of the supported stores. The Runtime Environment for the integration component manages the data flow between the various stages/modules and the caching of the intermediate results. In order to parallelize the data processing, the data is partitioned into entities prior to supplying it to a transformation module. An entity represents a Web resource together with all data that is required by a transformation module to process this resource. Entities consist of one or more graph paths and include a graph URI for each node. Each transformation module specifies which paths should be included into the entities it processes. Splitting the work into fine-granular entities, allows LDIF to parallelize the work. LDIF provides three implementations of the Runtime Environment: 1. the in-memory version, 2. the RDF store version and 3. the Hadoop version. Depending of the size of your data set and the available computing resources, you can choose the runtime environment that best fits your use case. The in-memory implementation keeps all intermediate results in memory. It is fast but its scalability is limited by the amount of available memory. For instance, integrating 25 million triples required 5 GB memory within one of our experiments. Parallelization is achieved by distributing the work (entities) to multiple threads. This implementation of the runtime environment uses an Jena TDB RDF store to store intermediate results. The communication between the RDF store and the runtime environment is realized in the form of SPARQL queries. This runtime environment allows you to process data sets that don't fit into memory anymore. The downside is that the RDF Store implementation is slower as the In-memory implementation. This implementation of the runtime environment allows you to parallelize the work onto multiple machines using Hadoop. Each phase in the integration flow has been ported to be executable on a Hadoop cluster. Some initial performance figures comparing the run times of the in-memory, quad store and Hadoop version against different data set sizes are provided in the Benchmark page. Flexible integration workflow. Currently the integration flow is static and can only be influenced by predefined configuration parameters. We plan to make the workflow and its configuration more flexible in order to make it easier to include additional modules that cover other data integration aspects. This section describes how LDIF configuration files look like and which parameters you can modify to change the runtime behavior of LDIF. A Schedule Job updates the representation of external sources in the local cache and it is configured with an XML document, whose structure is described by this XML Schema. The scheduler configuration is the top configuration file that references all the other configuration files like the for the import jobs for accessing remote sources and for the integration job. Both relative and absolute paths are supported. An Integration Job is configured with an XML document, whose structure is described by this XML Schema. The current structure is very simple because the integration flow is static at the moment, but that will change in future releases. The config file specifies amongst other things how often the whole integration workflow should be executed. It should be noted that when an integration job starts, it only works on fully imported data. Data of import jobs that did not finish before the integration starts is ignored - the only exception is if the oneTimeExecution configuration property is set to true; then the integration waits for all import jobs to finish. runSchedule - how often the integration is expected to be run. Valid values are: onStartup, always, hourly, daily, weekly, monthly, yearly and never. Both relative and absolute paths are supported. In this case there is a root directory with the config file and the test.properties file in it. Furthermore the following directories would be nested in the root directory: linkSpecs, sources and mappings. Data sets have to be in a local directory. validateSources Source data sets, R2R mappings and Silk link specifications are all validated before starting with the actual integration. discardFaultyQuads If LDIF finds a syntax error (like spaces in URIs) in the source data, it does not progress with the integration to give you the opportunity to fix these errors first. However, sometimes you just don't care that some quads are faulty and want them to be ignored instead, so that the overall integration can still proceed. useExternalSameAsLinks Besides discovering equal entities in the identity resolution phase, LDIF also offers the opportunity to input these relationships in form of owl:sameAs links. The files containing these owl:sameAs links has to be placed in the source directory with the other data sets. entityBuilderType Specify the type of the entity builder component used for the local execution profile of LDIF. This choice heavily influences the performance and memory foot print. quadStoreType Specify the concrete store that should be used as backend for the quad store version, see configuration property entityBuilderType. uriMintLabelPredicate The value of this property is a space separated list of property URIs, which will be used to expand the namespace URI specified with uriMintNamespace. For each entity one value of the specified URIs is used to act as the local part of the minted URI. If there are many values to pick from, the max value (lexicographic order) is taken. If no value could be found for any of the properties, the URI of the entity is not minted. refreshSchedule - how often the integration is expected to be run. Valid values are: onStartup, always, hourly, daily, weekly, monthly, yearly and never. Optionally, the renameGraphs parameter allows to specify a regular expression that will be used to rename the imported graph names, by removing the matching values. In a SPARQL import job the sparqlImportJobelement specifies the endpoint that will be queried for data and a restriction pattern, note that angle brackets of URIs have to be escaped using &lt; and &gt;. This restriction pattern is joined with the pattern ?s ?p ?o, which is also the only pattern in the Construct part of the generated SPARQL Construct query. This means that all the triples of the entities matching the restriction in the pattern element are collected. It is also possible to specify a graph with the graphName element and to restrict the number of imported triples with the tripleLimit element. All but the endpointLocation are optionals. renameGraphs - a regular expression that will be used to rename the imported graph names, by removing the matching values. Of each crawled resource all received triples are stored. The result of each import contains provenance metadata, whose structure is described by this ontology. original location (only for Quad and Triple Import Jobs). <http://dbpedia.org/graphA> rdf:type ldif:ImportedGraph ldif:provenance . <http://dbpedia.org/graphA> ldif:hasImportJob _:dbpedia0 ldif:provenance . <http://dbpedia.org/graphB> rdf:type ldif:ImportedGraph ldif:provenance . <http://dbpedia.org/graphB> ldif:hasImportJob _:dbpedia0 ldif:provenance . _:dbpedia0 rdf;type ldif:ImportJob ldif:provenance . _:dbpedia0 ldif:importId "dBpedia.0" ldif:provenance . _:dbpedia0 ldif:lastUpdate "2011-09-21T19:01:00-05:00"^^xsd:dateTime ldif:provenance . _:dbpedia0 ldif:hasDatasource "dBpedia" ldif:provenance . _:dbpedia0 ldif:hasImportType "quad" ldif:provenance . _:dbpedia0 ldif:numberOfQuads; "23592"^^xsd:nonNegativeInteger ldif:provenance . _:dbpedia0 ldif:hasOriginalLocation "http://example.org/dbpedia_dump.nq" ldif:provenance . 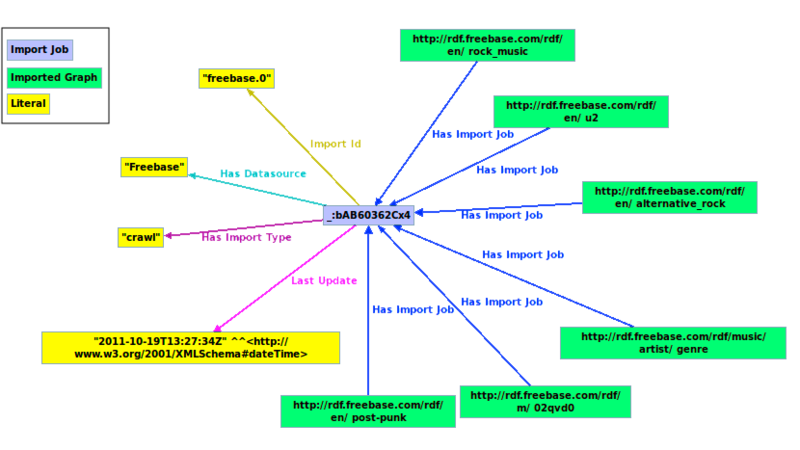 A Data Source is configured with an XML document, whose structure is described by this XML Schema. It contains human readable information about a data source. The label element should be a unique string in each integration use case, because it will be referenced by the import jobs. This section explains you how to run the different versions of LDIF. The example will run in about 3 minutes. In the meanwhile, you can check the progress of the scheduled jobs through the status monitor interface, available at http://localhost:5343. Integration results will be written into integrated_music_light.nq in the working directory, containing both integrated data and provenance metadata. The configuration properties that need to be used are quadStoreType and databaseLocation (see the Configuration section from more details). Please note that most of the run time for this small use case is dominated by the Hadoop overhead. Where input path is the (HDFS) path to the source data sets directory and output path is the location where on the (HDFS) file system the result should be written to. Learn more about Hadoop configuration by looking at our Benchmark and Troubleshooting wiki pages. In order to have a cleaner console output, consider replacing the Hadoop default logging configuration ([HADOOP-HOME]/conf/log4j.properties) with our customized log4j.properties file. This section presents two LDIF usage examples. The Music example shows how different music-related data sources are accessed using the LDIF Web data access components and integrated afterwards using the LDIF data translation and identity resolution modules. The Life Science example shows how LDIF is used to integrate several local RDF dumps of life science data sets. Each source is accessed via the appropriate access module. The DBpedia data set is downloaded, Freebase is crawled because of lack of other access possibilities, MusicBrainz and BBC Music are both accessed via SPARQL because no download of the data set is available and crawling is in general inferior, because you might not gather all the instances you are interested in. The target vocabulary is a mix of existing ontologies like FOAF, Music Ontology, Dublin Core, DBpedia etc. Music artist and record instances are integrated from all the sources. Labels and genres are integrated only from fewer sources since not all of them provide this information. For example MusicBrainz does not support genre information. Please note that the execution of the import jobs can take about 3 hours, mainly due to crawling, which is relatively slow compared to other access methods. This example shows how LDIF is applied to integrate data originating from five Life Science sources. The example is taken from a joint project with Vulcan Inc. and ontoprise GmbH about extending Semantic Media Wiki+ with a Linked Data Integration Framework. Uniprot, which provides information on protein sequence and function. A subset of these datasets can be found in the sub-directory examples/life-science/sources of the LDIF release. The following mapping file provides for translating the vocabularies used by the source data sets into the Wiki ontology. The following Silk identity resolution heuristics are used to find genes and other expressions that are described in multiple data sets. To run the example, please download LDIF and use the following LDIF configuration. The configuration options are explained in the Section Configuration below. Change into the LDIF root directory. 01:  @prefix aba-voc: <http://brain-map.org/gene/0.1#> . 02:  @prefix rdfs: <http://www.w3.org/2000/01/rdf-schema#> . 03:  @prefix uniprot: <http://purl.uniprot.org/core/> . 08:    _:Ab12290 aba-voc:aliassymbol "Oprk1" . 12:    <http://purl.uniprot.org/uniprot/P61981> rdfs:seeAlso <http://purl.uniprot.org/geneid/18387> . 13:    <http://purl.uniprot.org/geneid/18387> uniprot:database "GeneID" . 01:  @prefix smwprop: <http://mywiki/resource/property/> . 02:  @prefix xsd: <http://www.w3.org/2001/XMLSchema#> . 05:     <http://brain-map.org/mouse/brain/Oprk1.xml> smwprop:EntrezGeneId "18387"^^xsd:int . 06:     <http://brain-map.org/mouse/brain/Oprk1.xml> smwprop:GeneSymbol "Oprk1"^^xsd:string . 10:    <http://brain-map.org/mouse/brain/Oprk1.xml> smwprop:EntrezGeneId "18387"^^xsd:int . There are two source graphs, each containing data from a different source: ABA (input: line 5 to 9) and Uniprot (input: line 11 to 15). Since the Silk identity resolution heuristic concludes that both URIs identify the same entity, the both URIs are replaced in the output with a single URI (in this case the ABA one, output: lines 5, 6 and 10). The rewritten URI is linked by owl:sameAs to the original URI (output: line 11). In the target vocabulary Entrez Gene IDs should be represented using the smwprop:EntrezGeneId property. Property values should be represented as xsd:Integers. Thus, the aba-voc:entrezgeneid triple in the first graph (line 6) is translated into a smwprop:EntrezGeneId triple in the output data (line 5) and a datatype URI is added to the literal. The smwprop:GeneSymbol triple in line 6 of the output is generated by a structural transformation out of the two triples in lines 7 and 8 of the input data. The quad with the property smwprop:EntrezGeneId on line 10 in the output was produced by a complex mapping that had to consider all three quads of the input (lines 12-14). The specification for Sieve defines that only one value for the property smwprop:EntrezGeneId should be picked. As fusion function we picked KeepFirst, which just chooses the first value it sees for each entity. This means that only one of the quads in the output lines 5 and 10 would show up in the target data set, which in this case would result in the same value. We regularly carry out performance evaluations. For more details and the latest results please visit our Benchmark results page. The framework can be used under the terms of the Apache Software License. For questions and feedback please use the LDIF Google Group. Commercial support for LDIF is available through mes|semantics. Christian Becker: How to integrate Linked Data into your application (Slides). Semantic Technology & Business Conference, San Francisco, June 2012. Andreas Schultz, Andrea Matteini, Robert Isele, Pablo Mendes, Christian Bizer, Christian Becker: LDIF - A Framework for Large-Scale Linked Data Integration. 21st International World Wide Web Conference (WWW2012), Developers Track. Lyon, France, April 2012. Pablo N. Mendes, Hannes Mühleisen, Christian Bizer: Sieve: Linked Data Quality Assessment and Fusion. 2nd International Workshop on Linked Web Data Management (LWDM 2012) at the 15th International Conference on Extending Database Technology (EDBT 2012), Berlin, March 2012. Christian Becker, Andrea Matteini: LDIF - Linked Data Integration Framework (Slides). SemTechBiz 2012, Berlin, February 2012. Andreas Schultz, Andrea Matteini, Robert Isele, Christian Bizer, Christian Becker: LDIF - Linked Data Integration Framework. 2nd International Workshop on Consuming Linked Data, Bonn, Germany, October 2011. Volha Bryl, Christian Bizer. Learning Conflict Resolution Strategies for Cross-Language Wikipedia Data Fusion. 4th Joint WICOW/AIRWeb Workshop on Web Quality Workshop (WebQuality) @ WWW 2014, Seoul, South Korea, April 2014. William Smith, Christian Becker and Andreas Schultz: Neurowiki: How we integrated large datasets into SMW with R2R and Silk / LDIF (Slides part 1, part 2). SMWCon Fall 2011, Berlin, September 2011. Tom Heath, Christian Bizer: Linked Data: Evolving the Web into a Global Data Space. Synthesis Lectures on the Semantic Web: Theory and Technology, Morgan & Claypool Publishers, ISBN 978160845431, 2011 (Free HTML version). Christian Bizer, Andreas Schultz: The R2R Framework: Publishing and Discovering Mappings on the Web (Slides). 1st International Workshop on Consuming Linked Data (COLD 2010), Shanghai, November 2010. Robert Isele, Anja Jentzsch, Christian Bizer: Silk Server - Adding missing Links while consuming Linked Data (Slides). 1st International Workshop on Consuming Linked Data (COLD 2010), Shanghai, November 2010. Julius Volz, Christian Bizer, Martin Gaedke, Georgi Kobilarov: Discovering and Maintaining Links on the Web of Data (Slides). International Semantic Web Conference (ISWC2009), Westfields, USA, October 2009. This work was supported in part by Vulcan Inc. as part of its Project Halo and by the EU FP7 project LOD2 - Creating Knowledge out of Interlinked Data (Grant No. 257943). We would like to thank Rutvik Sheth (UBS) and colleagues for their extensive feedback. WooFunction icon set licensed under GNU General Public License.